On 10th May 1940 the Germans started invading France, Belgium, Netherlands and Luxembourg and the country became acutely aware of its vulnerability and of the need to supplement the regular army. On 14th May the Government made a short broadcast on BBC radio with a request for volunteers for the LDV (Local Defence Volunteers). This request was aimed at all those men who were not already serving with the Armed Forces and who were aged between 17 and 65 years, of reasonable fitness and resident in the UK. It was not meant to be an alternative to being called up for full time service neither was it meant to be full time or entail living away from home. On 23rd August 1940 Winston Churchill changed the name of LDV to the Home Guard as he felt LDV was "uninspiring". The Home Guard was under the overall control of the War Office but was controlled by HQs, the nearest to Beckingham being Gringley on the Hill. For each Home Guard Battalion there would be four Companies made up of four to five platoons and with each platoon split into four sections. A section would normally consist of approximately 25 men and could be sub-divided into squads. Each Battalion would therefore contain approximately 1500 men, which for administration purposes would be a Home Guard unit. Brigadier General Sir Joseph Laycock helped with the formation in the Retford area and it was probably he who formed the nucleus of officers from men he knew, and who formed the 10th Battalion, Notts Home Guard. From the above there was a Special Squad formed to defend the River Idle Bridge on the road between Misterton and Haxey Gate Railway Crossing, of which Sergeant Aldam (No 1 Platoon) was in charge. George Percival Proudley who lived in what was known as 'Percy's Cottage' (now demolished) that was situated by the lane where Southfields stands across the dual carriageway from Bar Road South. His brother, Robert Day Proudley lived on Low Street. Rex Madin’s father was Lance Corporal in the Home Guard (B Madin) and was in the stretcher bearing section. He remembers his father being called out to search for a German Parachutist that had come down and he recalls them finding him also. Frank Adams (father of Norman, Doug, Philip and Joyce Adams) was Second Lieutenant and surprisingly is listed as being under No1 Platoon in the register. We can only assume this was an error when writing up the register as Frank Adams was living in Beckingham at the time and all Beckingham men came under No 2 Platoon. Ron Brumby, whose nephew Geoff still lives in the village, worked at the Shipyard building mine sweepers and his work was essential for him not to be called up to the main forces. He enrolled as volunteer for the Home Guard. Evelyn Leggott (nee Pipe) whose father was a farmer served in the Home Guard. Evelyn (who organises the Beckingham School Reunion each year) and her family lived at Marsh Farm down Old Trent Road. This farm has since been demolished. 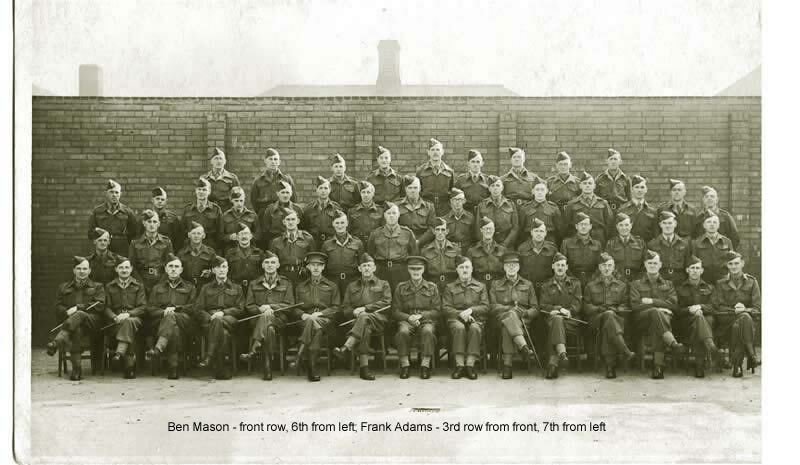 Both Marshall’s and Rose Brother’s in Gainsborough had their own Home Guard section and employees (including Percy Brumby from Beckingham who worked at Marshall’s) would do part of their training through the workplace. Fred Gosling who is the oldest resident in Beckingham had an older brother, Frank Reginald who was listed as being in the Home Guard. Frank lived in one of the Shipyard houses on Old Trent Road with his sister Gertrude Mable. Percy Horey who lived at The Hall joined the Home Guard and served as Lieutenant before moving to Nottingham in 1941/2. His son, Mike, recalls his father always used to go out during the air raids and on one occasion returned with large pieces of light green parachute silk and several yards of woven silk cords which were kept and used as dressing gown cords. On this occasion this was most probably a ‘land mine’ that had been dropped from enemy aircraft. He reported the find of the silk canopy which was collected later by the local policeman. There was some speculation that the PC′s wife spent the rest of the war wearing silk underwear! His father also told him of several old phosporous bombs which he had been instructed to bury in a field somewhere in Beckingham. It is hoped that since this time the cases have rotted away and they have ignited underground as they have never come to light since. On another occasion he told of an incident when they were called out on a night exercise and one of his men accidentally let off a round of bullets as he was rushing to leave the house ­ and which passed through the ceiling, narrowly missing his wife upstairs in bed! J W Quince, who lived on Bar Road South, probably took over the role of Lieutenant once Mr Horey left the village. Supply guards for vital points (railways, power stations, petrol stores and pumps etc) and for internment camps. of the mediaeval type but consisted of lengths of piping into which had been welded bayonets. Later, everyone had rifles and bayonets and there were a few Lewis Machine Guns which had originally been designed to be used in aircraft, probably in WW1. Volunteers far exceeded the Government’s expectation of 150,000 with nearly a million and a half joined within 6 weeks. As time went on everyone was supplied with a serge suit and leggings and the supply of weapons increased steadily to Thompson Sub Machine Guns from the United States, Sten Guns, Mills Bombs, Blacker Bombards and Rifle propelled grenades, besides blankets, groundsheets, tin hats and first aid packs. Members of the 10th Battalion Home Guard would have worn the cap badge of the Sherwood Forester’s. Most of the clothing and equipment issued was issued locally. There were stores located at the Manor House, High Street, Gringley but the main Battalion Stores were first issued from the Police Station in Retford and later from a storeroom in Union Street. 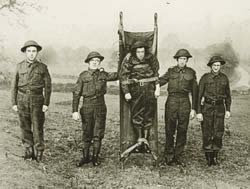 The Home Guard volunteers would hold meetings and train regularly and for this they would use any available spare building or open ground. 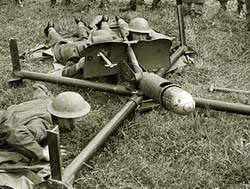 They would work out every Sunday on The Green in Beckingham where one of the tasks would be to take a Blacker Bombard to pieces and put together again. Of course, the Hare and Hounds Public House was only a stone’s throw from this area and so after drill this was the usual place to go afterwards! Just opposite The Green was a hut where meetings would take place and indoor drills carried out. This hut was later used as a scout hut and finally, before eventually being demolished, ended up being used at Liz Smith’s garden nursery down Station Road. There was also a rifle range held on a piece of Henry Gourley’s land opposite the houses on Wood Lane but when and how often this was used is not known because allegedly they had just one rifle and one bullet between them! Gringley used their Village Hall on High Street and opposite, above Blackwell’s Grocers Shop (no longer there), was the Headquarters for the area. There were some ammunition stores located in a brickshed, off Gringley High Street and a rifle range in a sandpit opposite the old Cross Key’s Public House (later the Sherwood Lodge and presently empty). Walkeringham met in a club room above the Blacksmith’s which was located opposite where the Three Horseshoes Public House used to be. The Hall at Beckingham had a ‘back bedroom’ which was used as a recreation room by the army as it had its own private outside staircase. 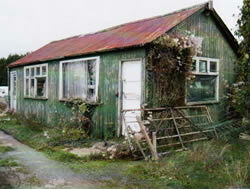 Sandy Furze Farm in Beckingham was used as a searchlight camp. At Gringley Beacon there was a row of cottages (now demolished) which was used for piquet duties and had sleeping facilities in an emergency. There were some Decontamination Sheds built in an old farmyard at the top of Cross Hill, Gringley and the Women’s Land Army huts were located at West Wells, Gringley. The ARP would meet in the cellar of Croft House, Beckingham and in Gringley at The White Hart Billiard Room (now residential house) on High Street. On the stand down of the Home Guard in December 1944 808 medals were awarded, one of which (MBE) was awarded to Captain C W Hopkinson of 10th Battalion, Notts Home Guard for his services. All former Home Guard personnel would automatically have received the Armed Forces Veteran’s Badge and the Defence Medal (which was green and orange with a thin black stripe). The Home Guard was eventually disbanded 31st December 1945. 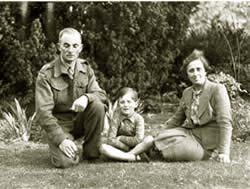 Much of the above information was assimilated by Peter Mason from papers of his father (Major Ben Mason) who was based at the Headquarters in Gringley.